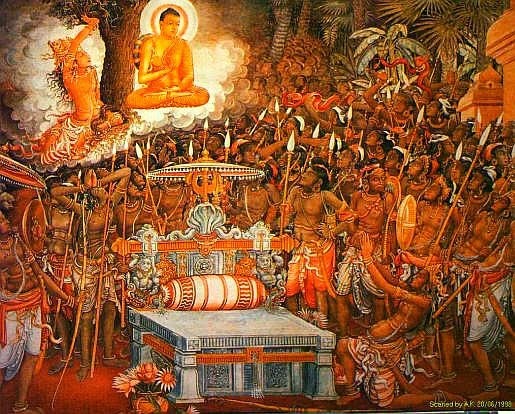 In the fifth year of becoming Buddha, He, perceived with His Divine Eye, a dispute was brewing in the island of Sri Lanka, between the two Naga factions between the two Naga communities under the Kings Chulodara and Mahodara. According to Mahawamsa – the great chronicle was that Mahodara, was the ruler of the Naga Kingdom of the sea. His younger sister was given in marriage to a Naga King who was residing on Kannavaddhana mountain. Her son's name was Chulodara.His mother's father had given to his mother a valuable magnificent Gem studded throne.A dispute arose this ultimately ended with a battle between the uncle and nephew. Both were engaged in a tussle to own the Gem studded throne.It was on Bak full moon Poya Day the Enlightened One visited Nagadeepa in Northern Sri Lanka to settle the dispute, as peace-maker and preached His Dhamma to the Naga community. This was his second visit to the blessed Sri lanka. The Buddha visited Sri Lanka, accompanied by a deity or deva namely Samiddhisumana.